Marrying contemporary finishes with classic design; the Brushed Steel Breakfast Bar Stool Brown is a timeless piece that will bring a touch of style to any room. 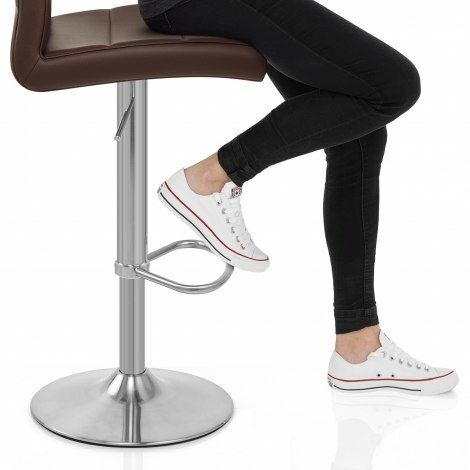 A high-class item with luxurious qualities, the Brushed Steel Breakfast Bar Stool exceeds expectations. 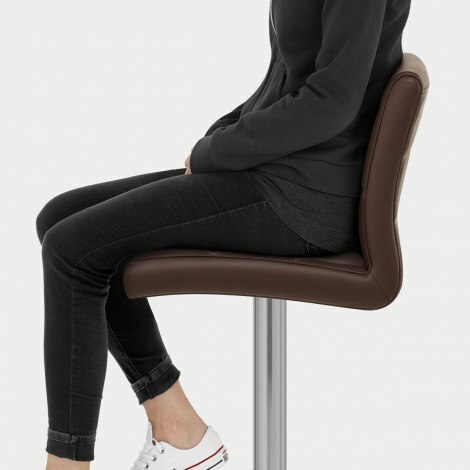 Upholstered in brown faux leather that promises never to go out of fashion, the seat and backrest feature a horizontal stitched design, which continues around the back of the seat. Both are ergonomically shaped, and filled with long-lasting high-density foam for outstanding comfort. The hand-brushed steel frame includes a simple gas-lift for adjustable height and 360-degree swivel movement, as well as a striking triangular footrest for added support. The round base boasts a rubber floor protector to help to prevent damage to your floors, strengthening the practical appeal of the Breakfast Bar Stool.